Wow...it's been a month since my last post. That is so irresponsible of me. It's not that I haven't had any news to blog about. It's just that I've been nervous to say too much about it for fear that something might go wrong. But, I'm taking a leap of faith and posting pictures of our NEW HOUSE!!!! 3 weeks ago, I went house hunting in Burleson with my mom, Kendall, and Kathy (Kendall's mom). Ryan couldn't go because of school and work. After looking at house after house after house of nothing that I really loved, I found it. I called Ryan when I got back to my brother's apartment and told him that I knew he'd love it and that I could see us making it home. It is a newer house, but in an established neighborhood with lots of trees and NO CONSTRUCTION going on around it! That's really hard to find these days! I showed Ryan pictures, and without ever laying eyes on the house, we made an offer on it. Talk about trust!! We were looking for a house that was move-in ready, but that we could still invest in making a lot better over about 3 years. There's something about blood, sweat, and tears that Ryan and I really love, so we're excited to get to work on it. You'll have to keep the "before" pictures in mind, and I'll be posting updates as we re-do a lot of things. The craziest, probably stupidest, thing about the fact that we already bought this house is that Ryan still hasn't signed on the dotted line about his job in Burleson yet. Yep, I guess that's what you call putting all of your eggs in one basket. We really did just take a leap of faith in purchasing it before all of the details are official, but I know that it's going to all work out. It's not the first time we've done something spur of the moment. So after lots of repainting, new floors, changing fixtures, and some other things, we hope to move in late this month, or August 10th at the latest. We have our apartment until then, and we can't afford a mortgage and our rent at the same time for too long. We can't wait to be closer to all the people we care about! You'll all have to come visit us! Here is the entry...where you see carpet, we'll be putting in wood floors to match the floors in the living room. We'll also get rid of the ugly brass light fixture. Some things I love about this house are the windows, the molding, and the fact that none of the ceilings are square. This is the dining room...The ceiling fan will go away, and we'll put a chandelier in...wood floors in here also. Our "maroon" study won't be maroon for long either...it'll get painted. Lots of updating to do in the kitchen, but I'm excited about it! I love buying new appliances. And that light in the eating area has to go...it reminds me of a cheap pizza parlor or something. My realtor, Bill, in the living room. This is one I got off the internet, so all of the owner's stuff is still in there. We don't have to do much to this room...I actually like it the way it is! 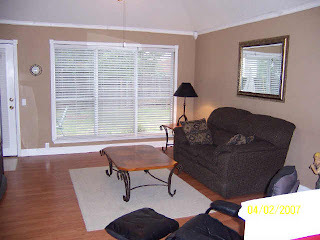 They did a great job with the molding and flooring, and I like the paint color too. This pink room will be the guest room, but it won't stay pink. This is what we are calling the "empty room" because I won't let anyone call it the "N" word. (aka. nursery) Perhaps it will be an "N" word while we live here, but for now, it's just the empty room. Nuff said about that. My master bedroom, which will also get a paint job. Periwinkle blue just isn't my color. The master bathroom...not huge, but really nice and bigger than any I've had so far! My golfing family is WAY excited about the golf course that is literally right behind the house. There are lots of walking (for me)/jogging (for Ryan) trails too, which is going to be really nice. I love the house!! I LOVE the hardwood floors :) It is VERY nice. I bet you can't wait to get to work. We WILL get together again before August 10th too!! HOLY COW!!!!!!!!!!! I love it!!!! YUPEE!!!!!! Hey you! Awesome house! It dosent look like it needs alot of work at all. It looks so great from the outside. Good for you guys! I hope everything else is going great for you. Shoot me an email when you get a chance and I will do the same! I love that house Sarah and am so excited for yal! how exciting for all these changes and to pull that trigger! I liked your comment about the N word, I know exactly what you mean! Ours was called the "study" and didn't have any foreshadowing of becoming what it is now :)! Love the house! How exciting! What a great house! We're so excited for y'all! I love the house...it will be fabulous! Even though you are leaving Houston - I am so excited for y'all! love it! It reminds me of ours in Keller!!! I can't wait to see it in person! Okay so I think our homes are probably built by the same builder..so much of the inside looks like ours! It looks amazing....I happy you guys found something you love so fast! You're so funny that you talk about all that you want to do to it. It looks like a GREAT home! Yay for you guys!!! And I'm sure Brittney will be so glad for you to be closer to her!